For more golden slices of life, please visit: Our World Tuesday. Posted in Our World Tuesday, photographyTagged beauty, golden, lake, Nature, poetry, stunning, swan, swan lakeBookmark the permalink. You pick the best titles for your picture shows, Lady Fi. And, really, you don’t need to apologize for offering your gorgeous photos – they are collectible! with my wife a dancer. Swans are such graceful creatures and the surface of the water in each image is wonderful! Swan Lake was never so beautiful as these photos. Nature is the best art, isn’t it? Beautiful! Your backyard is gorgeous in every season! Golden to Vermillion, oh so good. Superb, gorgeous captures — almost other worldly beauty! Thanks as always for sharing! Have a wonderful week, Fiona!! Such magnificent golden tones in your first image, in particular! All three are stunning captures! Just beautiful! The color is gorgeous! Dear LadyFi, magnificent and evocative. Thank you. Peace. Wonderful sequence with the swan. You capture such great colors in the sky and reflected on the water. Absolutely wonderful scenery and colors, great photos. Oh my goodness, these are SO beautiful, but the second one is pure magic! Wow and wow. And thank you. Oh Fi these are magnificent! 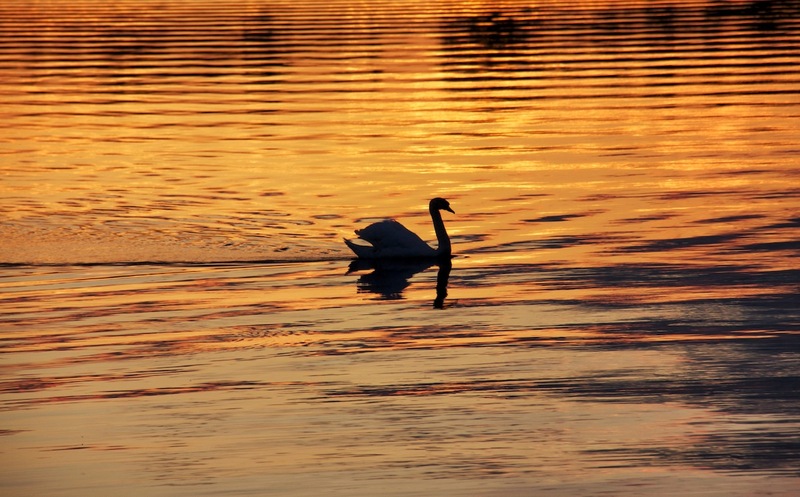 That pretty pictures, I like the warm tones and reflections on the river, beautiful swan! Wow, those graphical lines in the water, along with the color, really make this a standout! Those are indeed exquisite photos. Gives me a ripple of goosebumps! how do you get these lines|? Those lines are ripples created by a passing boat. You’ve captured them just beautifully! Awesome shots. I love the golden tones and graceful lines of these photographs. Amazing photos, really like the light you captured. Wow, these are gorgeous! I am drawn to the second one in particular. Beautiful colors/lighting –and I especially like seeing the swan in the water.. Gorgeous! The sunset colors upon the water are surreal! Just breathtaking! So lovely! reminds me of that piano piece I used to play when I was little – same title. Wow ! very impressive photos ! Swans are so graceful, like ballerinas. Wow! Just love these gorgeous golden photos! 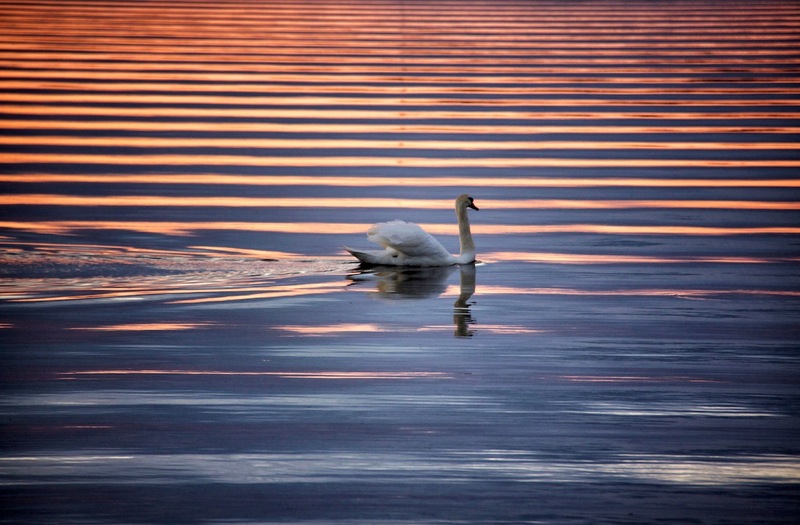 Marvelous photos of the lake, the swan and the waterlines. Great and amazing structures !!! I envy you your backyard, that’s for sure! Beautiful scene!! Boom, Bobbi and Gary. So hard to decide which image I like best!!! Do you ever have that problem? 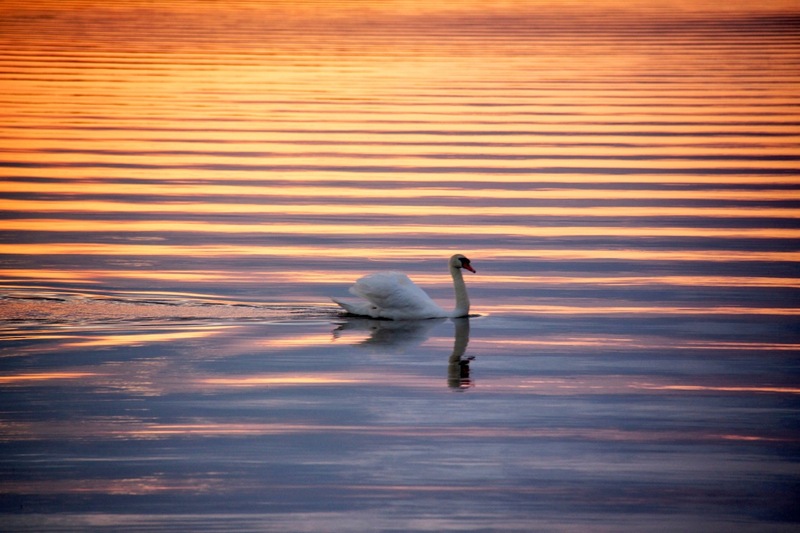 Wonderful swan and ripple photos, great captures – wow! Your photographs are always so full of vibrant colour and texture. I love them, especially when there are swans. I have a great fondness for swans. Incredible just doesn’t seem a good enough word for this dazzling post!! Wow. This is the paradise for sure! !…”I’ve imagined it?! !”… no doubt… in a fairytale…it looks just like this one… Glad to see such perfect vision! 🙂 Have a great week ahead, Fi! Oh my! These are so beautiful! It would be hard to pick a favorite, but the background of concentric ripples and reflected color is amazing. Jeg elsker de gylne toner i det første bildet! Bildene på bloggen din er himmelske! Måtte finne ut mer om deg! Oh my God these are exquisite! Breathtaking really! love the graphic design and colors – breathtaking, Fiona! Gosh, Fi. That’s not shameless. You’re truly talented and if that means you’re able to sell prints then so be it! Another lovely post.